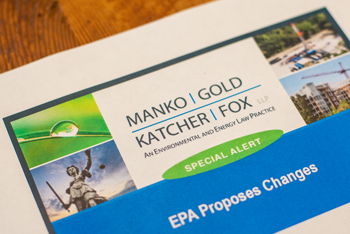 The Pennsylvania Department of Environmental Protection (“PADEP”) is moving forward with proposed fee increases to generate additional funding for PADEP’s Air Quality Program. If finalized, these changes would affect thousands of facilities in the Commonwealth. Most critically, PADEP is proposing (1) to increase existing fees for permit applications and annual emissions fees for Title V facilities; and (2) to establish new fees for the review of certain information by the Air Quality Program for which no fees are currently required. annual Title V emissions fees. notification of asbestos abatement and demolition/renovation. The proposed fee changes would be meaningful. For example, an RFD would cost between $400 and $600, depending on whether the applicant qualifies as a small business. An asbestos notification would cost $300. PADEP currently reviews RFDs and asbestos notifications at no charge. For major sources, the base fee for a New Source Review Plan Approval application would increase from $5,300 to $10,000 (the fee would be even higher if New Source Performance Standards (“NSPS”) and/or National Emission Standards for Hazardous Air Pollutants (“NESHAP”) apply). Likewise, an annual operating permit maintenance fee for Title V facilities of $5,000 would replace the current annual administration fee of only $750. And for non-major sources, the base fee for renewing a non-Title V operating permit (excluding NSPS- and NESHAP-affected facilities) would jump from $375 to $1,500. With respect to annual emissions fees, PADEP is apparently still considering several options, but the Department’s preferred approach would increase the cost per ton of pollutant emitted from approximately $90 to $110 (up to a maximum of 4,000 tons per pollutant per year, as PADEP is not planning on adjusting or eliminating the current cap). The increased fees would take effect for emissions generated during calendar year 2018, with payments due by September 1, 2020. As of now, PADEP is indicating that it may use the increased revenue to support development of an electronic permit application system for general permits, implementation of an electronic fee payment system, and employment of additional Air Quality Program staff. But PADEP is still in the early stages of the regulatory development process, with a draft proposed rulemaking and related, supporting information slated for delivery first to the Air Quality Technical Advisory Committee, and then to the EQB, over the next several months. Following consideration by the EQB, the proposed rule will be published for public comment. If finalized, the proposed fee changes would affect large numbers of facilities in the Commonwealth. Interested parties should therefore stay tuned as these issues continue to unfold, including identifying opportunities for public participation in the ongoing regulatory development process. For further information, please contact Kate Vaccaro, Esq. at kvaccaro@mankogold.com or (484) 430-2329.